I’m so happy when the temperatures drop to bearable and the leaves start falling! I know people talk about Spring being great, new beginnings and all that jazz but for me Fall is the time of sweaters, comfort, snuggling and the start to some of the best holidays. Like Halloween! So, when I came upon these awesome items at the Dollar Tree, I quickly realized I could procrastinate the rest of my day (dishes, vacuuming and laundry) to make an inexpensive and cool Halloween wreath, I said- YES, PLEASE! Lucy even helped me decorate! What you need to make this inexpensive and cool Halloween wreath. green foam floral ring (styrofoam wreath) 10 in. 6 stem floral garden artificial purple and black rosebushes, 14 in. white cotton creepy cloth, 30 X 72 in. skeleton block sign, 29 in. I started with the foam floral ring. Using some old black scrap fabric, I wrapped it around the wreath. I secured it with hot glue. Next, I took the decorative mesh tubes and cut them to about 10 inches. I tied them onto the wreath at regular intervals. The sweat equity of this wreath came next. I separated the end pieces of the decorative mesh. It came out looking frizzy and cool. It took quite a while but you could easily do it while watching television. I liked the look, but if you wanted your wreath fluffier, shell out another dollar and buy another package of decorative mesh tubes. Cut the pieces longer and I think you’ll get more fluff! Glue on the fun stuff! When the decorative mesh was separated out, I removed the flowers from the stems and used the glue gun to secure them to the wreath. I liked them all together. Two spiders came attached to the floral bushes. I removed them and glued them on as well. As you can see they are purple, which I really liked. They still looked scary but because of the contrast you could see them pretty well. There are tons of other inexpensive creepy crawlies to choose from. I loved the simplicity of the these purple spiders but you can make your wreath as colorful as you like. The skeletons that I used on the wreath were actually a garland. I have a few of these that I use every year on my dining room chandelier. They have such a neat, old look to them. Today, I wanted them for the wreath so I simply cut the hanger part off the top of the head and glued them onto the wreath. I think the Halloween wreath turned out great and it was really inexpensive! Definitely a ton of bang for my buck!! 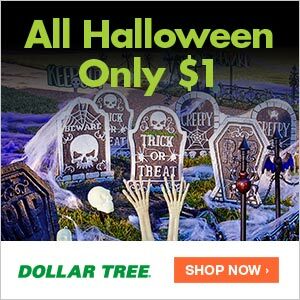 It was so fun to go to the Dollar Tree and be inspired but not have to spend an arm and a leg…or a spleen…;) I spent about $4.00 total on the wreath and $6.00 on the other cool Halloween stuff to decorate the entryway! I did have a few items already like the scrap fabric and glue for the glue gun, but still, BARGAIN!! Looking for other cool wreath ideas? Check out this Fourth of July wreath! Not really a wreath kind of person? You’re not alone. Neither is Laura! Check out her blog: In My Defense…Thoughts on Wreaths and Pantry’s. Be ready to laugh!